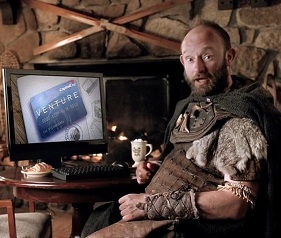 Who would have guessed that Vikings could sell credit cards? There are a lot of companies out there that are selling credit cards to consumers. Why has Capital One succeeded where so many other firms have failed? I’ve got one word for you: analytics. The product managers at Capital One have always taken a scientific approach to marketing. What this means is that they have taken the time and energy needed to create ways to analyze and segment their customers in a way that allows them to create new product offerings and then work with their account manager and business development manager coworkers to offer them in a way that they’ll appeal to their customers. It sure seems like analytics should really be part of a product manager job description these days. The product managers at Capital One realized that they had a commodity product on their hands – credit cards. They looked around for ways to make their product offering different from everyone else’s. What they discovered was a set of different ways to create industry leading products. These included offering teaser rates on their credit cards and zero-balance transfers. These offerings are commonplace now, but they were started by Capital One. So just what did the Capital One product managers do differently that allowed Capital One to become such a big success? It turns out that analytics was just part of the story. Other credit card companies were also using analytics at the same time. What the Capital One product managers did differently was to use their analytical data differently — they applied strategic management to their data. The other credit card companies were using their data almost exclusively to create predictive models that they would then use to drive the marketing campaigns for their cards. Capital One product managers turned this on its head by creating a culture of testing based on analytics. This meant that they were using the data that they had collected to test different types of offers. It also gave them opportunities to test, test, test different product combinations. This was in marked contrast to all of their competitors who were forced to put all of their eggs into just a few very large scale marketing campaigns and hope for the best. In the past 20 years, the product managers at Capital One have grown their credit card product line from nothing to being one of the biggest credit card issuers with more than 40 million customers. The way that the Capital One product managers were able to get their products to stand out in an already crowded field was to find ways to harness the power of analytics better than any of their competitors. Like all of their competitors, they collected a lot of information on their customers. What the Capital One product managers did better than their peers was to use this information to build products that were even more successful. This is exactly what the rest of us would like to be able to put on our product manager resume. All of the other credit card companies had access to the same types of data. What the Capital One product managers did better was to use this data to perform a great deal of market testing. This allowed them to introduce more products and to tailor those products to better meet their customer’s needs. We can all learn that asking our customers “What’s In Your Wallet” just might be the best way to become a better product manager. Question For You: Do you think that getting trained on how to use analytics to process customer data is something that every product manager should learn? Here’s a classic product management question for you: how well do you know your customers? I mean, do you know then REALLY well? We all like to say that we know what our customers are looking for, but do we? The product managers over at the online gaming company Zynga (you know, the one that went from nothing to $600M in revenue overnight) can say that they do know their customers very well. They’ve got the analytics to prove it.